I began my drive to work this morning with more than the usual number of half-awake, inattentive, suicidal drivers pulling out in front of me without accelerating, so I made the decision to take the longer, but less used, route. After all, what’s the use of getting to work if I arrive so frustrated from the drive that I’m unproductive? So as I pulled onto the road, several miles out in the country and began traveling north, I looked around me at my surroundings. The rolling hills of Oklahoma were a rich green after the nourishing rains of May and the pasturelands were hemmed in by the darker greens of tree-lines denoting where brooks and streams ran. The sun was just beginning to come up and cast a mixture of pastels across the sky, transforming the greens of the land into shimmers of rainbow light as the dew captured the morning. Above the rills, and deep in the dales, courses of fog sat in the still air; their clouds adding a majesty and mysticism to the scene. Within these mists a herd of cows stood with several calves beginning to wake for the day. Amongst the herd was a proud bull, standing at the top of the hill, with its defiant horned head pushed out in silhouette, as if breathing and exulting in the cool morning vapors. The whole scene struck me as reminiscent of many others which I’ve experienced; poignant because the heart is, for a moment, tuned correctly to see the beauty with which we are surrounded. I don’t say, “With which I was surrounded,” because it is not just I who was surrounded at that time … we are all surrounded by it all of the time. I just wish that I/we were more tuned to see it more often. I remember several years ago, when I was working in Tennessee, being confronted with one of those moments when my heart was tuned to pick up on the beauty and majesty around me. It might have been the intensity of the smells which all of a sudden gathered my senses to the moment. In the wee morning hours (before 0500) the mists sat in the valleys, much like I described in my trip to work above. But because it was the time of the year when they were fire-curing tobacco, the rich aromas of that highly-protested leaf were held prisoner by the thick air. As I drove to work, with my windows down, the vibrancy of the smell waxed and waned as I rose out of the cloud at the top of a hill and then plunged down into the next fog-laden valley. There was also the feel of the air which struck my heart. I knew that the afternoon would be a stifling mix of high humidity and high heat, which made the early morning chill a wonderful experience ahead of the perspiration and discomfort to come. The whole scene was beautiful and my heart drank it in. A few weeks ago I was in Utah for some training and, being a lover of the mountains, I simply had to (no really, I had no choice) make several trips up into the granite crags overlooking the Salt Lake Valley. I hiked and walked through the high grassy knolls and was awed – as one simply must be – by the view. It always seems like the sky is so much bigger and enveloping on top of a mountain and the blue of the heavens reached down below my feet to meet the hazy gray of the desert in the distance. But it wasn’t just the majesty of the mountains that caught my attention. Looking down onto the path in front of me, I saw, amidst the pebbles and tufts of grass a single tiny purple flower peeking out from a crack in the rocks. I don’t know why it caught my eyes. I’ve seen hundreds of thousands of wildflowers. For goodness sake, I’ve seen thousands of purple wildflowers – many of them much larger, more intricate and beautiful than this one. So why would this one call my attention? 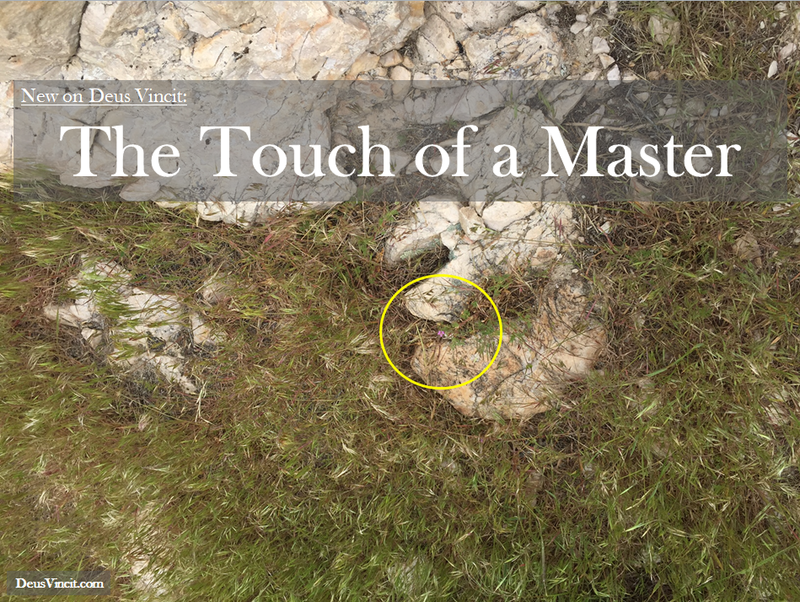 My mind turned that question over and the answer which came to me is a simple one: it is the touch of a master. I’ve always wondered what actually makes art either good or bad … and extended that to what then constitutes a “masterpiece.” After all, there is a lot of junk out there that people have attempted to foist upon us as “brilliant” or “masterful” which doesn’t even seem to be possible to define as “art.” If the definition is, “something that is created with imagination and skill and that is beautiful or that expresses important ideas or feelings” (Merriam-Webster), then how does something like Andres Serrano’s infamous “Piss Christ” qualify? Though it may express those ideas or feelings that may be “important” to the “artist,” they are neither beautiful nor “created [by] imagination and skill” (since antagonism to God is not imaginative nor is peeing in a jar skilled). Nevertheless we are told that it is art. This kind of nonsense is not limited to art which hinges its relevance on edgy “thoughtfulness” though. 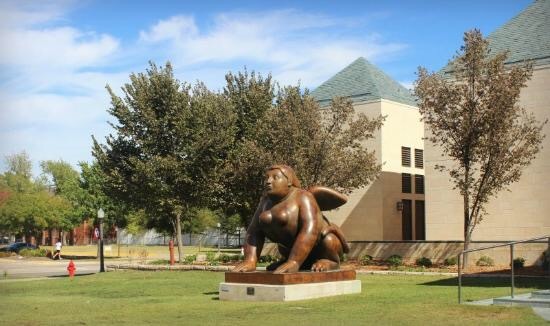 For example, if you were to drive around the beautiful campus of the University of Oklahoma you would see outside of the art gallery, mucking up the view of manicured green lawns and vibrant flowerbeds, a very strange sculpture which is (evidently) supposed to be a sphinx. Its squatty body looks like a rather unattractive head of a woman was plastered on the shoulders of a man, the arms of a gorilla, the wings of a pigeon, the rear end of a lion and the legs of a lizard. Now, I know that this sculpture seems to resemble some pagan fertility goddess and might (might) be considered art simply because it conjures up that comparison. I also concede that it might require a fair amount of skill to put together the travesty of form that the “Sphinx” is. But I have a hard time believing that anyone could think of it as either imaginative, beautiful or expressive of important ideas or feelings. It is just … well … sitting there, taking up space and inhibiting the view of a rather nice-looking building (in other words, the “art” is less aesthetically pleasing than the utilitarian architecture behind it). They were stymied. It wasn’t that they had no answer, but that they had too many. Superlative craftsmanship, extraordinary design, great antiquity, rich materials, purity of form, artistic genius, originality, influence on other artists. All those qualities, and more, bubbled into the discussion. “It became evident that it is extremely difficult, if not impossible, to articulate a definition of masterpiece that could be accepted universally,” writes Louvre director Henri Loyrette. If it is that difficult for the curators of the most famous art museum in the world to come to an agreement about what makes great art, to the point where the director of that museum even concedes that it may be impossible, why do we even attempt to argue for a delineation to be made? And I don’t want someone to give me some stupid answer to that question like, “Well, the fact that the art – whether ‘Piss Christ’ or the Sphinx – has brought such a visceral response from you indicates its importance as ‘art.’” Emotion (or passion, as it maybe should be understood) isn’t something that denotes value. There wouldn’t be any value to me responding back to that kind of an answer with a punch in that person’s face, but it would certainly illicit a visceral and emotional response from them. Nonetheless, there MUST be an answer to the question of art. Admittedly – and this almost turns my stomach to say – subjectivity must have something to do with an object’s aesthetic value. To go back to the things mentioned by Ms. Abbe in the quote above, craftsmanship, design or evidence of genius are certainly some things which can contribute to the value that can be placed on a piece of art. For example, I might think of a music box as a piece of art, not because it necessarily plays a beautiful tune nor because it is decorated in an appealing way, but instead because it causes me to marvel at the mastery of the one who made it. Age is also a factor in art. A piece of pottery which has survived the eons might become more beautiful and valuable to us simply because of the ages that lie upon it; forcing us to wonder at a simple terracotta pot because it conjures the weight of millennia on our psyches. Rich materials might objectively increase an object’s value, but when coupled with purity of form, it might also increase the value of an object beyond its elements. In other words, the ability to shape marble into a sculpture, or to capture the lushness of a sunset on a canvass, can bring us joy and astonishment which has value intrinsically. All of this brings me around to the tiny, fragile, unassuming, purple flower that I saw in Utah. The mountains were powerful, the vista was awe-inspiring, the blue skies were joyous, the trees and the rocks framed the picture perfectly … but the little flower was the thing that brought it all together in a masterful way. In it was superlative craftsmanship, extraordinary design, great antiquity, rich materials, purity of form, artistic genius, originality, and abundant influence … and all of this combined in one small transient bit of life. It peeked its head out amongst the ever-renewing grasses surrounding it, out of the soil wedged between the relatively huge bits of rock on either side and connected by stone and mineral all the way down to the root of the mountain. Why would God pay attention to such detail? Why would He not leave well enough alone? I was standing there, drinking in the glory and authority of the greater scene. I was content in the power and majesty of the God who made the mountain, trees, sky and valleys. But God, being the master artist that He is, didn’t stop with those things. He flourished the ending. He embroidered the borders. He gilded the edges. He … left me wanting more. Unlike the greatest artist on earth, His detail never ends. His craftsmanship, design and genius just reveal His omniscience, and His antiquity, His originality and His influence reveal that He is the source of all the virtuosity of mankind. If I might be so bold, I’d like to redefine what we mean by “art.” Art isn’t simply “something that is created with imagination and skill and that is beautiful or that expresses important ideas or feelings.” True art is that which revels in who God is. If Rembrandt captured light in his painting, it is the light which is the painting’s glory. If Mozart captured rhythm and complexity in his composition, it is the rhythm and complexity which is the song’s glory. If David captured passion and substance in his poetry, it is the passion and substance which is that poem’s glory. And since it is God who is the artist who created light, the engineer of rhythm and complexity, and the author of passion and substance, it is God who we glory in when we see a work which captures our imagination. I realize that my definition of true art is only for those who believe in God and means nothing to those who reject Him. To be honest, I really have no interest in joining a debate about true art with anyone who doesn’t believe in, and try to follow, God. It seems like a complete waste of time to me to have a conversation about ANYTHING that is value-based with someone who has a different top priority in life. But, for those who ARE believers: if my definition of true art is correct, then I believe that we can objectively judge art. If you are able to match what you see in a sculpture, painting, design, writing or song to what God has revealed about Himself in scripture, then it simply must move you to revel in who He is. And who He is leads us to question how we conform ourselves to Him. And how we conform ourselves to Him leads us to question how we surrender ourselves to Him. And how we surrender ourselves to Him leads us back to who He is. It’s a continual cycle of humility before the All-powerful and awe that the All-powerful takes notice of you … much less why He cares for you. I can tell you exactly what I see in the silhouette of a bull against the mists of morning, or the pungent aromas of tobacco in the valleys of Tennessee, or the storms rolling in to Pike’s Peak, or the waves crashing on the shores of Central California, or the swaying of grasses in the prairies of South Dakota, or the tiny purple flowers in the mountains of Utah, or even in the perfection in the body of a football (soccer) player connecting with a perfect bicycle kick: I see a God who is immense. I see a God who is passionate. I see a God who wants His creation to know Him. I see a God who takes joy in our joys. I see a God who is the artist we all can appreciate. You made them rulers over the works of Your hands; You put everything under their feet: all flocks and herds, and the animals of the wild, the birds in the sky, and the fish in the sea, all that swim the paths of the seas.